ruthdelacruz | Travel and Lifestyle Blog : Congratulations to the Winner of 100% Guilt-free Shopper Bag from WFTO-Asia! Congratulations to the Winner of 100% Guilt-free Shopper Bag from WFTO-Asia! First of all, thank you to everyone who joined my little contest on how you can be 100% Guilt-free Shopper in support of the World Fair Trade Organization - Asia. I love reading your entries and it is nice to know that more and more people are getting aware of shopping with a conscience. As you know, Fair Trade is not just about recycling or taking care of the environment, but it is all about different causes such as fighting against disempowerment, low quality products, loss of cultural identity, ignorance, unsure livelihood, sweatshop, forced and child labor and anything that is not fair for the environment, animals and people. I hope you get inspired with this little contest, and please support the World Fair Trade Organization - Asia even with a simple step of liking their page or sharing the information about Fair Trade. 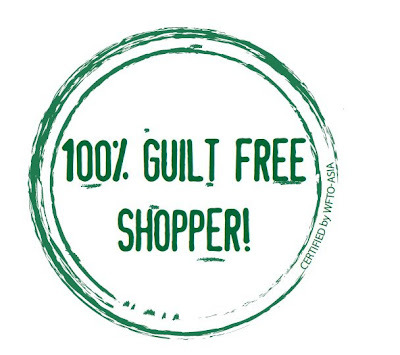 Now, the best part.. who is the winner of the 100% Guilt-free Shopper eco-bag (plus goodies!)? The winner was chosen by the World Fair Trade Organization - Asia team and WFTO Ambassador. Here is the note from the World Fair Trade Organization - Asia team! You won a 100% Guilt-free Shopper Eco Bag from the World Fair Trade Organization - Asia! Please send your name, contact details and mailing address to ruth.is.ruthilicious[at]gmail.com. If you want to own this fab bag, you can check out Fully Booked outlets or send me a note or contact the WFTO team. Thank you again guys and watch out for more contests! Happy Shopping! Don't miss out on my blog posts, please subscribe to my blog or like my Facebook Fan Page at Ruthilicious! © ruthdelacruz | Travel and Lifestyle Blog : Congratulations to the Winner of 100% Guilt-free Shopper Bag from WFTO-Asia!